Andrea Dunlop has become an auto by author for me. 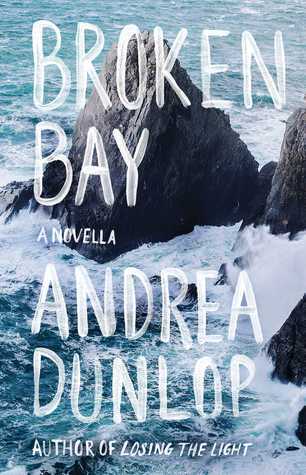 Her first novel, Losing the Light, was wonderful so I knew I needed to read her new novella Broken Bay. And look at that cover... how could you say no to that gorgeous artwork? I was not disappointed with Dunlop's most recent work and she kept me on the edge of my seat and little scared from start to finish. I even sent her a message about half way through the story, shaming her for scaring the mess out of me! The novella is a quick read, but be prepared to read the whole thank ing in one sitting because it is extremely difficult to put down. The characters in the novella are all so interesting. I loved getting to know a little about each of them and I felt like I was on the bachelorette trip with them. The conversations were all so honest and I loved how certain topics were discussed in such a realistic manor. It felt like the characters were real instead of some made up fantasy version of what girls want to be. I found myself wishing the novel was longer so I could hang out with the characters a little more. Broken Bay is a fun and quick read and I highly recommend it. I would love to read this again with friends because I think it would be a great book to discuss in a book club. There are too many things to spoil in this book so I will keep my review short in order to not give away too much! I highly recommend Dunlop's new novella. You won't regret picking it up!